Here Ye! Here Ye! Verily it is Proclaimed that VBS is OVER!! 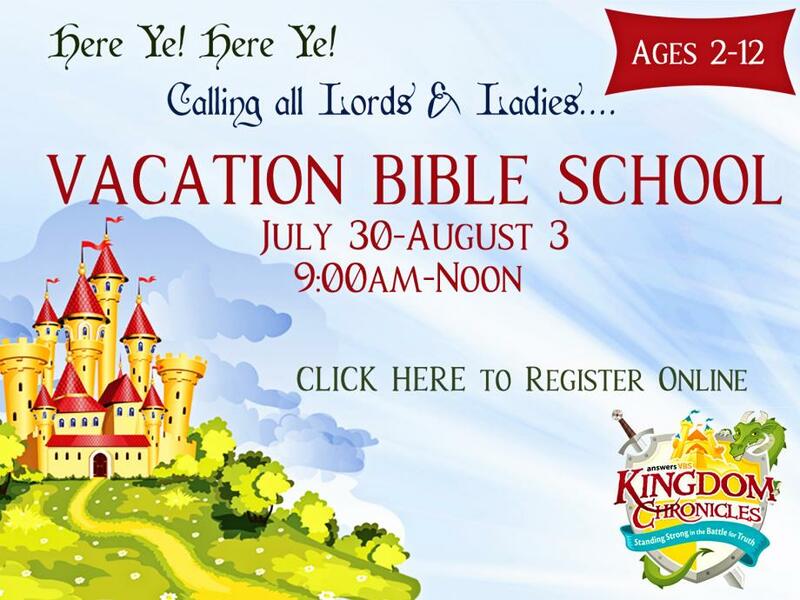 With The Kingdom Chronicles VBS, brave knights and fair maidens will be equipped to put on the full armor of God so they can stand strong in the battle for truth. They’ll love the fun praise and teaching songs, the daily skits, and the “Truth or Error” game. Plus they’ll see the contrast between God’s kingdom and Satan’s kingdom of darkness, and realize that they are not automatically born into the “good” kingdom but need to be saved from the “bad” kingdom through faith in Jesus Christ. Prepare for a royally fun time! VACATION BIBLE SCHOOL IS OVER. Thanks to everyone who participated. Be sure and scroll down to check out the week's pictures!